This video documentary explores the complex psychological, cultural, legal and financial issues surrounding an important and growing new trend: the home funeral movement. A Family Undertaking profiles several families who have made the decision to forego the typical mortuary funeral and instead prepare their loved ones at home for burial or cremation. We visit a variety of extended families who are learning and experimenting with ways to make the death of a beloved family member or friend more personal and meaningful, from preparing the body for burial or cremation at home, to designing and creating caskets which meaningfully reflect the individuals' personalities and values. In several cases the dying persons themselves participate in planning their funerals — most movingly in a scene where elderly rancher Bernard Carr helps to decorate his casket with the branding iron he has used all his working life. Prior to the 20th century, preparing the dead for burial was almost always done by family and friends, and interment itself was often on the family farm. This film's historical section suggests that the modern, institutionalized funeral home system began during our Civil War, when thousands of young men were dying far from home. Today it has become a multi-million dollar industry, and this provocative video ventures into its factories and national conventions, to shed light on some of its marketing strategies. The program recognizes that there are many caring professional undertakers (those who "undertake" to deal with funeral arrangements) and that their services are welcomed by many families. Yet a growing number of others feel that the process alienates them from one of the most basic facts of life. 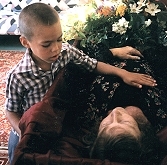 They find it unacceptable to turn the body of their loved one over to strangers, and point to research indicating that close contact with the body, even for children, can be helpful in the grieving process. Their compellingly expressed points of view will challenge viewers to reexamine their own attitudes toward life's only inevitability: death. A Family Undertaking is produced by Five Spot Films, LLC, for the Independent Television Service, with funding provided by the Corporation for Public Broadcasting. A presentation of the Independent Television Service. A Discussion Guide is available for this video. Please request your copy from the P.O.V. website. "Very enlightening. It allowed me to discuss this issue with my family." "This film really speaks to the deepest part of my soul. Thank you for this important offering." "One of the best shows I've seen and I can't get it out of my mind. It really moved me." "This film is an answer to my prayers. Thank you to the families." "A powerful and informative film." "Completely transformed my feelings about responsibility to our loved ones after death. Thank you." "Thank you for taking out the fear." Controversial documentary records the last days - and actual death - of a Dutch man who chose euthanasia to end his suffering from amyotrophic lateral sclerosis. Profiles the EXIT organization, which for over twenty years has counseled and accompanied the terminally-ill and severely handicapped towards a death of their choice.